TORONTO (May 8) – It appears, at the moment, the Maple Leafs hired Brendan Shanahan so he could help convince general manager David Nonis to fire Randy Carlyle’s assistant coaches. In what has to rank among the least-earned rewards in recent Toronto hockey annals, Carlyle was today given a two-year contract extension by the hockey club – Shanahan and Nonis choosing to blame the late-season catastrophe on the head coach’s lieutenants, Dave Farrish, Greg Cronin and Scott Gordon, all of whom were fired. Exactly what Carlyle did to earn the extension is beyond the scope of any person that watched the Leafs completely tune him out down the stretch of the regular season, when the club face-planted at 2-12-0 and missed the playoffs for the eighth time in nine springs. 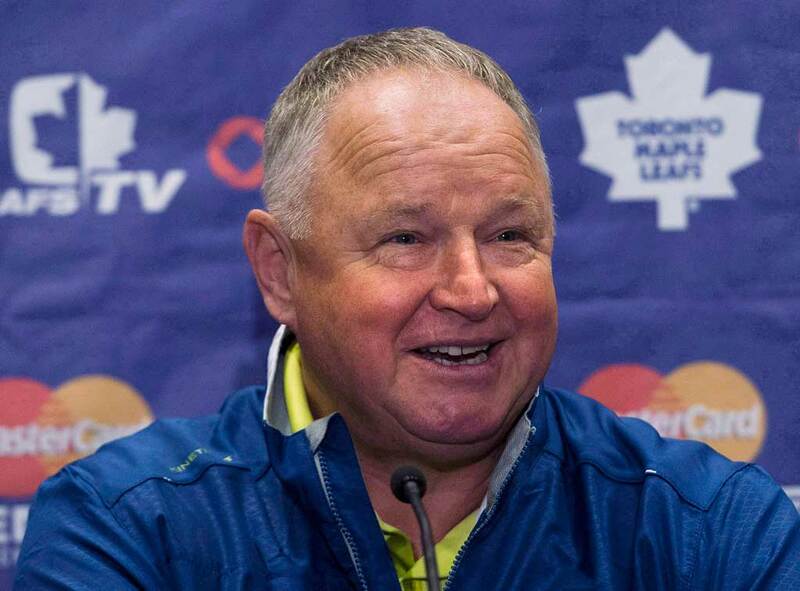 RANDY CARLYLE HAS LOTS TO SMILE ABOUT TODAY. For a hockey team that has long battled a perceived sense of entitlement, this might be the most profound example. The three assistants fired today were Carlyle’s personal choices to stay on when he replaced Ron Wilson in March 2012. Cronin and Gordon had been on Wilson’s staff; Carlyle added Farrish – his former right-hand man in Anaheim. Apparently, they were the reason the Leafs fell apart in March and April, along with such players (a year ago) as Clarke MacArthur and Mikhail Grabovski, who Carlyle ordered off the club last summer. The deed, however, has been done and Leafs will begin next season with Carlyle behind the bench. Of course, a contract extension today is worth only the ink on which it written. As Brian Burke proved with Wilson, it guarantees nothing in respect to term. It is now up to Shanahan and Nonis to provide Carlyle with players that will listen to him. My best wishes to both men. CAN HABS WIN A 25th STANLEY CUP? 1965 vs. Chicago – I was six years old and barely remember watching Game 7 at the Forum. Jean Beliveau scored the winning goal on Glenn Hall 14 seconds after the opening faceoff. Though the series went the distance, Montreal finished second to Detroit in 1964-65 with 83 points – seven more than third-place Chicago. The Cup win was no surprise. 1966 vs. Detroit – This series is still remembered for the controversial overtime clincher in Game 6 at Olympia Stadium when Henri Richard slid past Roger Crozier and into the Red Wings net with the puck under his left glove. Still, the Habs romped to first place in ’65-66 with 90 points – eight more than Chicago. And, Montreal rebounded to win the Cup after Detroit captured the first two games of the title round at the Forum. LEFT-TO-RIGHT: DOUG BARKLEY, HENRI RICHARD AND ROGER CROZIER EYE PUCK AT OLYMPIA STADIUM IN DETROIT. RICHARD SCORED DISPUTED CUP WINNER IN ’66. 1968 vs. St. Louis – During the first three years of expansion, when the NHL added teams in Oakland, Los Angeles, Minnesota, Philadelphia, Pittsburgh and St. Louis, the playoff champion of the newly formed West Division was offered up as a sacrificial lamb for the winner of the six pre-expansion teams – then grouped in the East Division. St. Louis Blues defeated Minnesota North Stars in double-overtime of Game 7 to win the West in ’68 and faced off against the Canadiens. Montreal swept the Cup final, though all four games were decided by just a goal. 1969 vs. St. Louis – The de facto Stanley Cup final was the East Division championship – a terrific six-game battle between the Canadiens and fast-charging Boston Bruins. Again, Jean Beliveau came through in the clutch, beating Gerry Cheevers in double-overtime of Game 6 at Boston Garden to send Habs up against the Blues for a second time. St. Louis, with former Canadiens goalie Jacques Plante, swept Los Angeles in the West and was again no match for Montreal in a four-game Cup final. 1973 vs. Chicago – Building toward their dynasty of the late-70’s, Canadiens finished atop the 16-team NHL with a 51-10-16 record for 120 points – 13 ahead of second-place Boston in the East and 27 massive points more than West champion Chicago. It therefore surprised nobody when Habs took out the Blackhawks in six games to provide Scotty Bowman the first of his record nine Stanley Cup titles as a coach. 1976 vs. Philadelphia – The Canadiens of Bowman, Ken Dryden, Guy Lafleur, Steve Shutt, Larry Robinson, Serge Savard et al began their string of four consecutive Stanley Cups by sweeping the two-time defending champion Flyers (a.k.a. the Broad Street Bullies) and re-establishing skill over skulduggery. Habs were far and away the best team in the league in ’75-76 wirh a 58-11-11 mark for a record 127 points, nine more than Philadelphia. 1977 vs. Boston – Arguably the greatest team in NHL history swept aside another pretty good outfit – Don Cherry’s Boston Bruins – to win a second consecutive Cup. The 1976-77 Canadiens were 60-8-12 for a record 132 points and lost only one of 40 home games. 1978 vs. Boston – Having “slipped” to a mark of 59-10-11 for 129 points (three fewer than the previous year), the Habs required six games to eliminate Cherry and the Bruins for Stanley Cup No. 3. Jacques Lemaire scored in overtime on Gerry Cheevers at Boston Garden to win the series and the NHL championship. During three seasons, the Habs were a remarkable 148 games over .500 in the regular schedule with a record of 177-29-34. At home, in the Forum, the Canadiens were 97-8-15. GREAT VIEW OF THE OLD BOSTON GARDEN AS 1978 MONTREAL CANADIENS POSE WITH THE STANLEY CUP. LEFT-TO-RIGHT IN PHOTO: PIERRE MONDOU, GILLES LUPIEN, SERGE SAVARD (18) LARRY ROBINSON, CAPTAIN YVAN COURNOYER, GUY LAPOINTE AND JACQUES LEMAIRE (25), WHO SCORED THE OVERTIME CUP WINNER IN GAME 6. 1979 vs. New York Rangers – This was an almost-accident Stanley Cup as Canadiens did not finish atop the regular-season standings. They were, however, just one point shy of the New York Islanders, who got bounced in the Cup semifinals by the terrific goaltending of Rangers’ John Davidson. Then, as so many of us know, Montreal took advantage of Don Cherry’s legendary blunder in Game 7 of the other semifinal at the Forum – the bench-penalty for too-many-men that allowed Lafleur to tie the score with less than two minutes to go. Yvon Lambert won the series in overtime and the Canadiens – after losing Game 1 of the Cup final – reeled off four straight for their fourth consecutive championship. 1971 vs. Chicago – Though Canadiens richly earned this Stanley Cup, it was hardly a no-brainer. In fact, it required one of the biggest upsets in playoff history. The 1970-71 Boston Bruins were the most prolific team in league annals, finishing with a record 57 wins, 121 points and 399 goals scored. Bruins had the top four NHL point-getters (Phil Esposito, Bobby Orr, Johnny Bucyk, Ken Hodge). Esposito destroyed the one-season mark for goals with 76 and Orr did the same in assists with 102. Boston out-distanced Montreal by 24 points in the standings. But, the Habs had a secret weapon: Rookie goalie Ken Dryden, who came up late in the season and performed spectacularly. Dryden led Montreal to an astonishing seven-game victory over the Bruins in Round 1 of the playoffs. Habs then defeated Minnesota in the semifinals and lost the first two games of the championship series to the Blackhawks only to fight back and force a Game 7 at Chicago Stadium. After falling behind, 2-0, Habs rebounded for a 3-2 victory and a surprise Cup under rookie coach Al MacNeil in Jean Beliveau’s final NHL season. NEWSPAPER IMAGES ?? OF MAY 19, 1971 – THE DAY AFTER CANADIENS DEFEATED BLACKHAWKS AT CHICAGO STADIUM FOR SURPRISE STANLEY CUP IN JEAN BELIVEAU’S LAST NHL GAME. THESE ARE FROM A SCRAPBOOK I MADE AS A 12-YEAR-OLD. 1986 vs. Calgary – The first of two Stanley Cups Montreal won largely by virtue of the NHL’s best team getting eliminated early in the playoffs. Having finished atop the NHL with 56 wins and 119 points, Wayne Gretzky and the Edmonton Oilers were poised to win their third consecutive championship. Then the back of Grant Fuhr’s leg got in the way of a clearing attempt from behind the net by defenseman Steve Smith late in Game 7 of the Smythe Division final. Calgary prevailed 3-2 before a stunned audience at Northlands Coliseum. Flames then took out St. Louis in seven while the Habs – behind the sizzling work of rookie netminder Patrick Roy – defeated Boston, Hartford and New York Rangers to reach the Cup final. Montreal prevailed in five, winning the title on May 9 at the Saddledome. Canadiens had finished 32 points behind Edmonton in the regular season. 1993 vs. Los Angeles – Not unlike seven years earlier, Canadiens took full advantage of a colossal upset elsewhere. Pittsburgh Penguins – with future Hall-of-Famers Mario Lemieux, Jaromir Jagr and Ron Francis – were gunning for their third consecutive Stanley Cup when the upstart New York Islanders took them out in the division final. Behind goalie Glenn Healy, the Islanders won Game 7 at Civic Arena when unheralded David Volek beat Tom Barrasso with an overtime slapshot. Islanders had finished 32 points behind the league-leading Penguins. Again, this opened the way for Montreal to reach the Stanley Cup final – defeating Quebec, Buffalo and the Islanders. The latter series went only five games, allowing the Habs to rest for eight days while Toronto and Los Angeles battled to Game 7 of the Campbell (or West) Conference final. Gretzky and the Kings prevailed at Maple Leaf Gardens and then took the Cup opener at Montreal Forum. But, Canadiens won consecutively in overtime at the L.A. Forum in Games 3 and 4 (John LeClair scoring both nights) and knocked off the Kings at Montreal in Game 5. Incredibly, Habs won 10 consecutive overtime matches in the ’93 playoffs. AND NOW, BACK TO THE PRESENT: As you’ve noticed, the Canadiens have a way of sneaking into the Stanley Cup final unexpectedly. It would be unfair to categorize such an achievement this spring as a total accident, for the Habs would first have to eliminate Boston Bruins – the consensus favorite to become Eastern Conference champion for a third time in four years. Montreal has taken two big steps toward that goal and can grab the proverbial stranglehold by defeating the Bruins again tonight at Bell Centre. Habs could also benefit from Minnesota pulling a shocker against the Blackhawks – the Wild romping to a 4-0 victory at home Tuesday to halve Chicago’s 2-0 series lead. Such a circumstance would be typical of the last two Montreal Cups, when the favorite was knocked off elsewhere. Even if that were to happen, Canadiens would still have Pittsburgh (as it appears) to contend with in the East final and either Minnesota, Anaheim or Los Angeles in the championship round. So, a 25th title would be well-earned – yet still partly an accident, as Habs were not in the Cup conversation before the regular season. Montreal has been the NHL’s hottest club since late in March – going 11-4-0 to end the schedule and 6-1 in the playoffs so far (almost 7-0 after leading, 3-1, in the third period of Game 2 at TD Garden). That’s 17-5 in Canadiens past 22 games. With Carey Price doing a terrific impersonation of Patrick Roy and Ken Dryden before him – and with the Habs’ exceptional speed providing Boston fits – nothing seems impossible right now for le bleu, blanc et rouge. HERE ARE THREE OF MY OLDEST UN-BOUND COPIES OF THE HOCKEY NEWS: THE SEPTEMBER 1971 ISSUE (ABOVE) WITH CANADIENS’ ROOKIE GUY LAFLEUR ON THE COVER. AND, THE ISSUES (BELOW) OF OCT. 15 AND OCT. 22, 1971.